In the main event of UFC 232 on Saturday night in LA, former UFC light heavyweight champ Jon Jones and fearsome Swedish contender Alexander Gustafsson finally stepped into the cage for a rematch of their 2013 classic. Just as it was in their first fight, the light heavyweight title was on the line. Throughout the first round, Jon Jones showed off far more striking diversity than he did in his first fight with Gustafsson, landing kicks and punches across all levels, a crackling elbow to the dome, and unfortunately, a knee to the cup. Alexander Gustafsson, however, had answers for every one of the former champion’s many takedown attempts. After this close first round, the pair returned for the second frame. In the early phases of this second round, Alexander Gustafsson unfortunately landed an eye-poke, but otherwise had much more success, as he began to find his range with his boxing and walk the former champion backward. 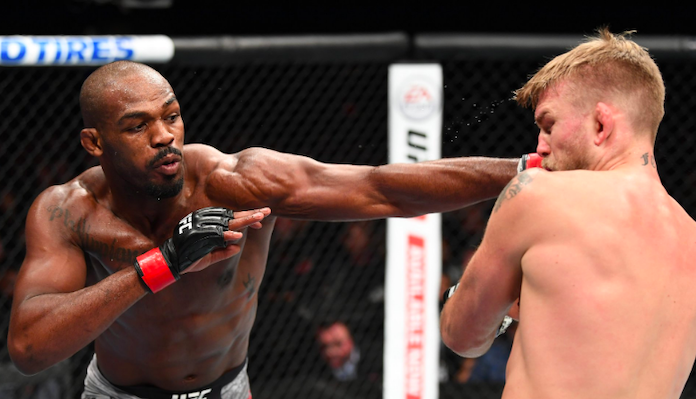 Toward the end of the round, however, Jon Jones began to surge back, mixing up his strikes, and punishing Gustafsson’s head and body with all manner of artillery. In the third, Jon Jones finally landed a takedown, and this this would prove to be his foe’s undoing. After a brief positional struggle, the former champion climbed onto his foe’s back. After briefly threatening with a rear-naked choke, he postured up and unleashed a storm of ground-and-pound until the referee could watch no more. With this victory, Jon Jones reclaims the UFC light heavyweight title, which was recently vacated by his arch nemesis Daniel Cormier. He’s now 23-1(1) overall. Post-fight, he once again offered Cormier the first shot at the light heavyweight title. In defeat, Alexander Gustafsson returns to the loss column after back-to-back defeats of Jan Blachowicz and Glover Teixeira. He’s now 18-4 overall.